Growing up in Westchester, I actually like Long Island a LOT more. There is much more to do and things are a lot more convenient - things in Westchester are very spread out and you have to drive everywhere. Getting to the city via the LIRR is much easier (especially since lots of towns you want walk to station). In Westchester the wait to even part at stations can be years. In Western Nassau there are some very quaint villages that you can walk to lots and still be close to Manhattan. All personal preference in what you want. Westchester. It's like LI with more hills. MNRR is light years ahead of LIRR in terms of commuter satisfaction. I don't think anyone would honestly choose the mediocre LIRR and godawful Penn over MNRR and GCT. And while the MNRR parking lots may have wait lists most villages have their own no-waitlist lots right there anyway. Its not an issue. LI has a lot more waterfront properties, great beaches and fishing. It'll be cool to live somewhere with so much easy beach access everywhere. I'm just concerned that it'll be hard for my kids to make new friends and become part of the community. Sounds like it's hard to break in to LI. I'm also introverted and shy so becoming their social chairperson sounds dreadful to me lol. Since my kids each started K here, it all developed organically for them. I guess it'll just help them in life later rather than having only been in one small place (which has had its drawbacks too). Its definitely very quaint and the schools are considered good (though not quite "top notch"). This is one of the preppiest areas that I've seen on Long Island. Lots of historic Victorian homes, old colonials and adorable shops/boutiques. Lots of boats and one of the beautiful large catholic churches rings their bell at certain times of the day giving that 1800's feel. If you drive or take a stroll down Main Street/Montauk Hwy and surrounding neighborhoods then you'll see many people there wearing Vineyard Vines/Brooks Brothers, boat shoes, bright colors and embodying the whole preppy look. This is in contrast to the heavy blue-collar/working class/"greaser" vibe that you find in most south shore towns. But beware that some parts of Bay Shore can be run-down, especially some parts around the LIRR tracks and Sunrise Hwy. I would've bought there in a second after renting there for a few yeara but it was way too far away from my job. Last edited by MemoryMaker; 06-11-2018 at 10:08 AM.. But the OP is looking for a community with a significant Asian population so I don't think she'll care all that much about Brooks Brothers and churches. Also a bit of a commute for her husband. I will tell you our story. Our boys were born in Suffolk co and we lived there until one was going into 7th grade and the other going into 8th grade. They went to a very small parochial school and we didn't want them to go to a huge school, so we moved completely to Pittsburgh. Sold everything, packed up without jobs and moved. Our kids thrived. They absolutely loved the school and just did as much as they could. My hubby and I couldn't settle down and make friends.It was also very hard for us to get jobs So two weeks ago, we moved to our vacation home in the poconos full time. Where are the kids ; well, they stayed in Pittsburgh for college and like living there. They totally understand where we were coming from ; financially the move to pittsburgh was a disaster and now we are in recovery mode. Long Island is not one bit isolating ; the people are there, they are familiar with people moving in and out. Many people in Pittsburgh have never been to the city of Pittsburgh. I love the village of Sayville ; I know it would be a commute, but it is such a great area. Plus, Main Street has at least five Asian eateries signifying a reasonably solid Asian presence in the area. 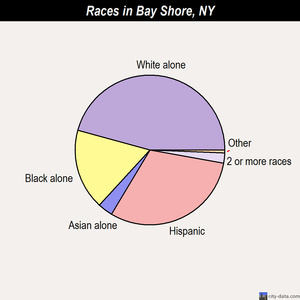 Bay Shore is located between two major hospitals and Asians have been traditionally attracted to the higher levels of the medical field. Not trying to pass it off as New Hyde Park or Jericho but I think an Asian would feel comfortable in the area. Last edited by MemoryMaker; 06-11-2018 at 11:42 AM..
Bayshore schools do not sound like they are in the same category as those of the areas the OP is currently considering. If she didn't care about paying for private school, only then would I recommend Bayshore.